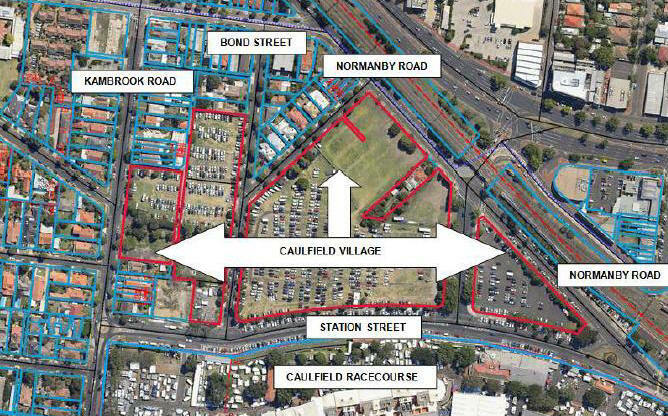 Caulfield Village is a large development being undertaken by the Melbourne Racing Club on land bounded by Normanby and Kambrook Roads and Station Street. 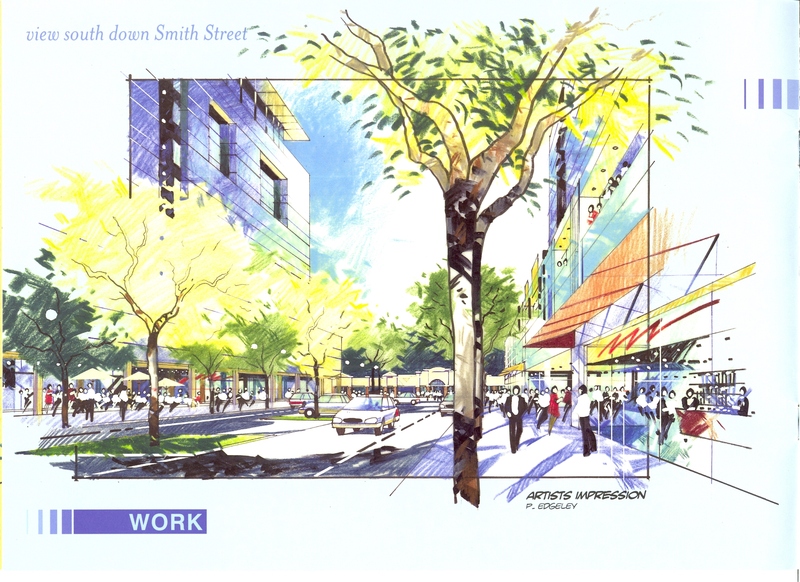 The site is approximately 5.5 – 7.7 ha and comprises grassy vacant land (Members Car Parks 1 & 2) and the “triangle” paved car parking area that services the Glasshouse Tabaret and Monash University. Centre of the Caulfield Racecourse (BBQ area). Come and also enjoy the park. 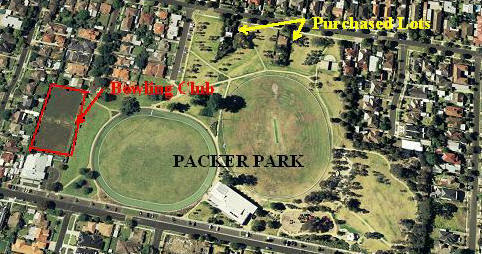 Please note vehicle access is via Glen Eira Road Tunnel. Don’t be put off by foreboding access, the left hand lane has an automatic gate – be patient while gate opens. If vehicle access is not available GERA representatives will be in Tunnel access forecourt. 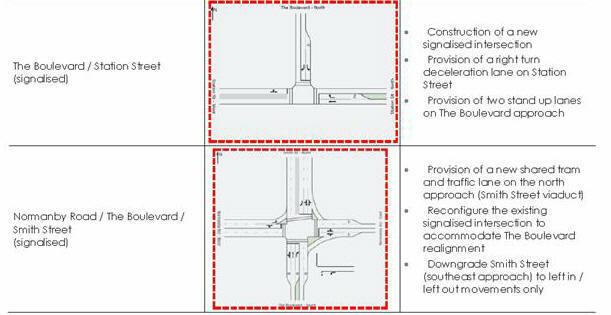 Vehicle and pedestrian access points. 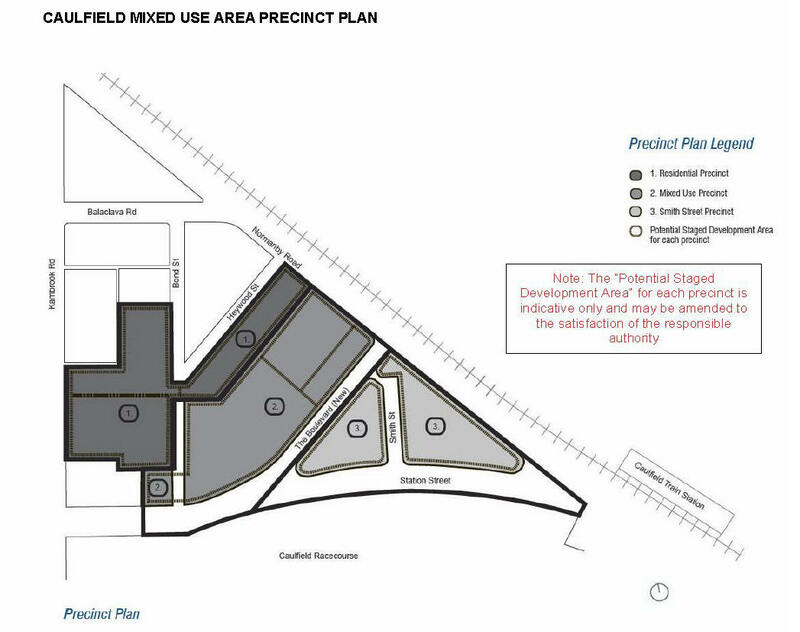 Sunday, 16 February, 2014 12.00 – 5.00 p.m.
Thursday, 20th February, 2014 5.00 – 8.00 p.m.
GERA believes that the significance of the C60/ Caulfield Village Development Plan is being understated. It has major impacts on residential amenity, traffic, parking, open space, and drainage for local residents and the broader community. Council’s statement that building heights, footprints and setbacks cannot be considered due to previous consultations is an opinion rather than fact. Of course they CAN and MUST BE CONSIDERED. 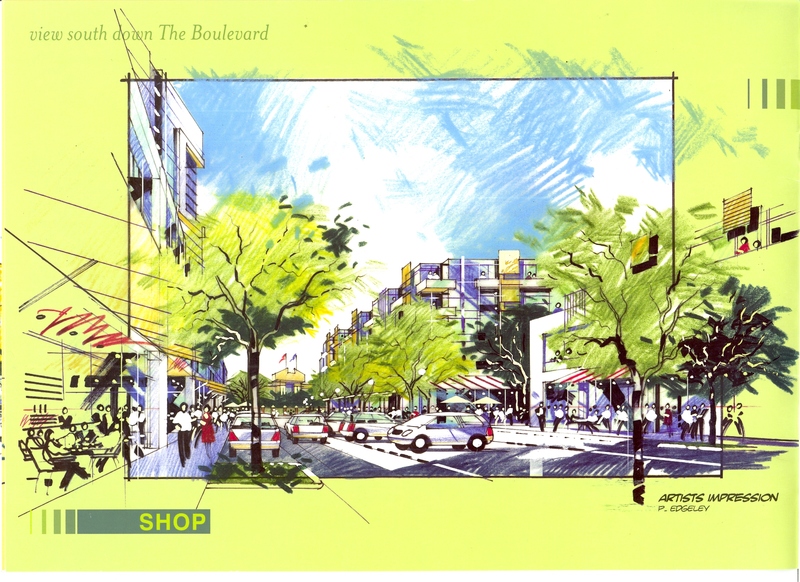 Compare what was previously presented to residents and what is now in the development plan. 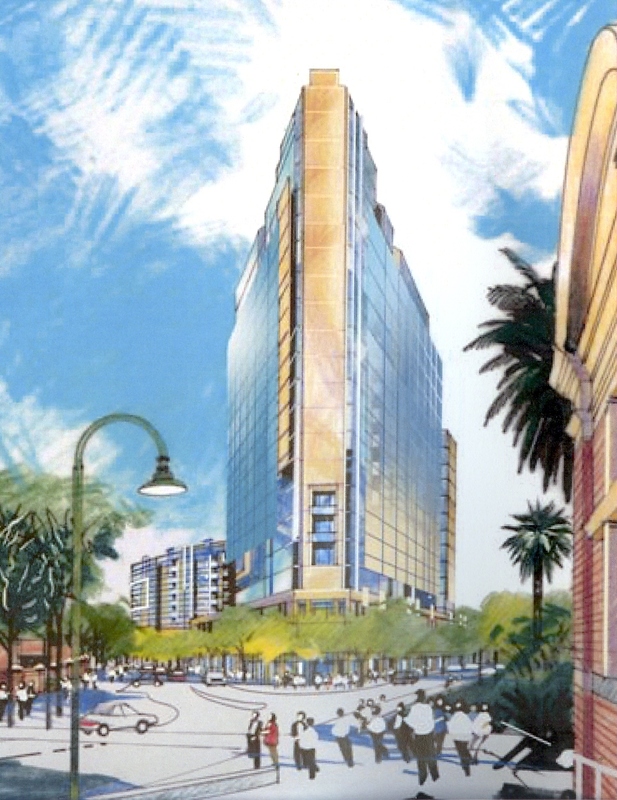 Building Heights – increased by 30-50% across site, eg. tower on the triangle now 20 storeys. 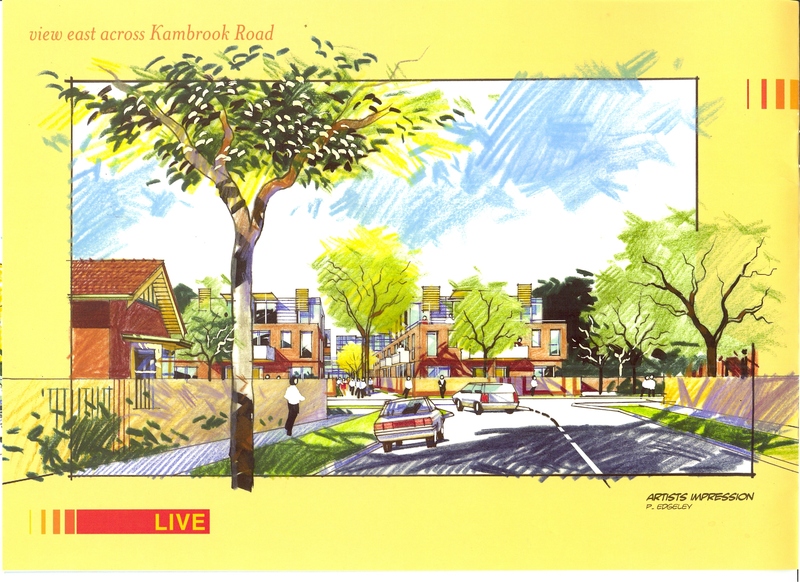 Setbacks – originally in line with planning scheme, planning scheme requirements now waived. 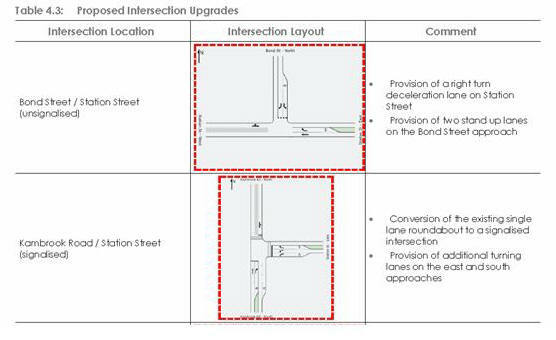 Traffic Impact – focused on major roads and within the site,flow on impact to residential streets not considered then or now. Parking Provisions – are basic res. code with NO ON-SITE VISITOR PARKING. Flow on impact of development and displaced parking on local residential streets not addressed then or now. 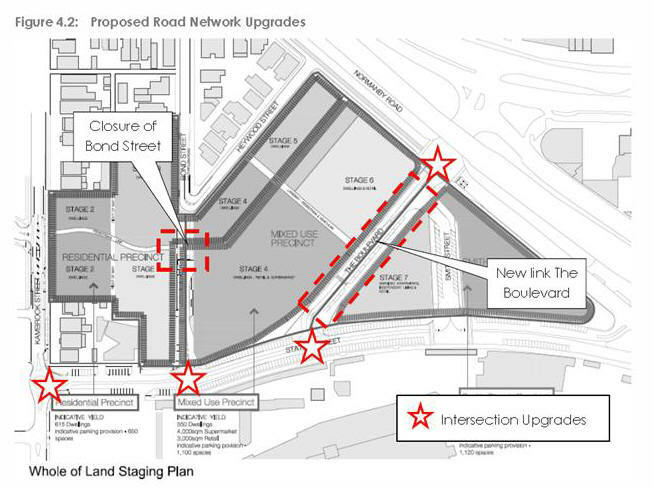 Current on-street parking provisions reduced. Construction Period – originally 10 years, now 15. 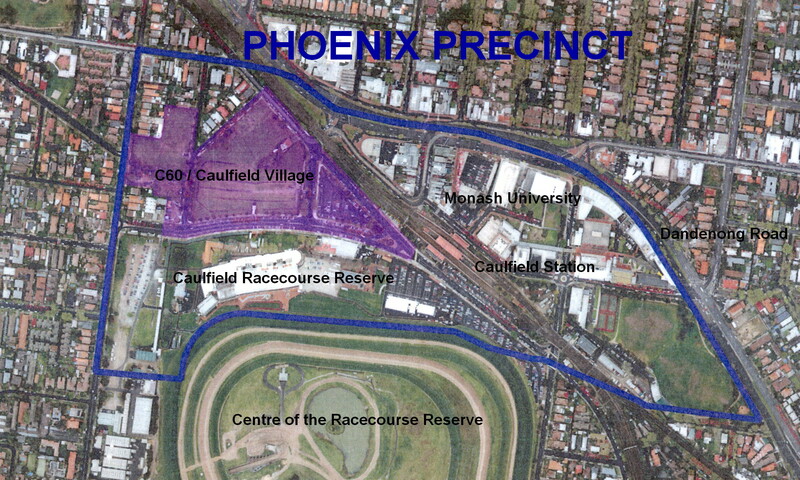 C60/Caulfield Village considered in isolation. 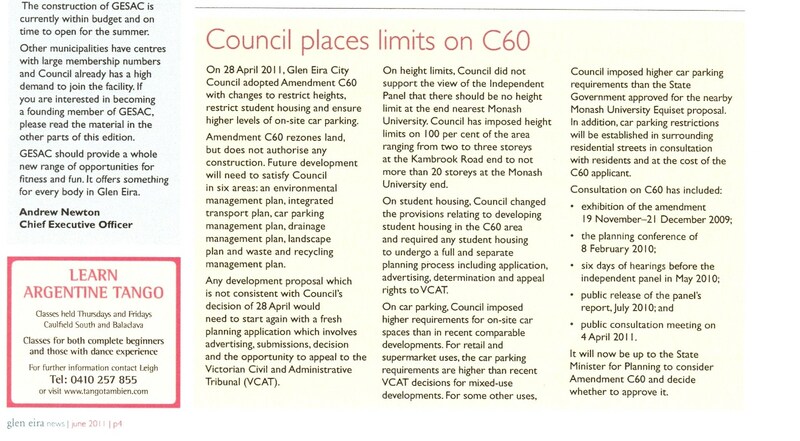 Impact of proposed Monash University Development – expected to be 10 storey site coverage – not considered. Current inadequate public transport infrastructure not considered. COME to GERA’s INFORMAL DROP IN & DISCUSS INFO SESSIONS and/or CHECK OUT OUR WEBSITE to LEARN MORE and KEEP ABREAST of happenings. Please note this posting has been updated with the above photo/map of the area and the above documentation links on 18/2/2014.